The Gerz “Limität” series of early Westerwald stein reproductions was begun in 1974 and, once each year from that point until the factory closed down in 1999, S.P. 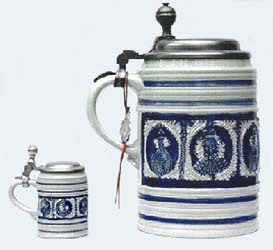 Gerz GmbH faithfully reproduced a new stein, each in editions of 10,000, from a pre-1850 Westerwald original. Since they are reproductions and not originals, a question may arise as to whether or not these are steins for the “serious” collector. For thousands of beer stein lovers worldwide, including any number of very serious collectors, the answer is an emphatic “YES.” Some of the reasons for reaching that conclusion are expressed below. In addition to the appearance factor, price is no small consideration. On those rare occasions when I have come across original early Westerwald steins that were aesthetically comparable to those in the Limität series, the prices ranged anywhere from $2,500 and up — amounts well beyond the typical collector’s beer stein spending limits. For even the most sought-after Limität steins, prices remain well below that range. For the most part, Gerz Limität steins are easy to spot. From an overall appearance standpoint, the steins each have the expected salt glaze texture and the traditional gray and cobalt blue coloring, with the occasional appearance of (ferrous) brown and (manganese) purple highlights. 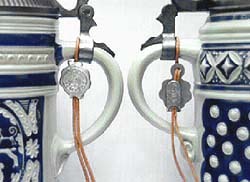 For identification purposes, in addition to a standard Gerz logo pressed into their undersides (Figure 4), each stein was given a pewter medallion which hangs from the handle on a leather strap. The medallions have a Gerz Limität emblem on one side and the stein’s individual number on the other (Figure 5). Further, all but one of the steins in the series are identified under the lid with raised lettering indicating both the year the stein was produced and the approximate vintage of the original from which the design was created (Figure 6). The only stein in the series produced without identifying information under the lid is the 1974 edition. 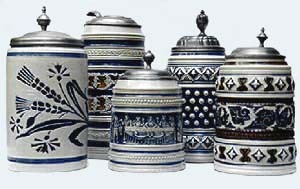 It is important to note, however, that there are other steins in the marketplace with Limität bodies, but without lid markings that are not part of the series. 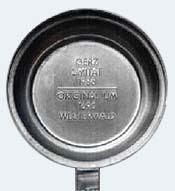 Unfortunately, the Westerwald-type stein bodies created for the Limität series were also occasionally used by Gerz to produce runs of less expensive, unnumbered steins with “generic” lids. I suppose that economics of scale made it reasonable from the manufacturer’s standpoint to get as much use out of a particular stein mold as the market would bear. From the collector’s perspective, however, this was clearly a less than desirable strategy. An unusual aspect of the Gerz Limität series is the fact that for each year between 1979 and 1997 (when bankruptcy was declared) Gerz also produced a miniature of the current edition to be used as promotional gifts for prospective dealers at various European trade shows (Figure 7). What’s most interesting about the miniatures is that their availability is far more “limited” than the “Limität” series steins themselves. Because they were not normally sold to the public, acquiring those miniatures presents an unusual challenge for collectors. 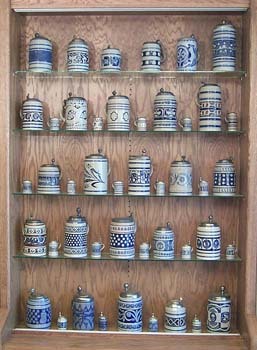 Typically, each dealer was given one of the annual miniatures as a token of appreciation for visiting the Gerz display. Only 500 of these miniatures were produced in any given year, making them rare indeed. I can attest from personal experience to the fact that the miniatures are substantially more difficult to find than most of the larger steins. However, in spite of their relative rarity, if you can find one, the price is likely to be relatively modest. This is true because collectors of the standard editions are largely unaware of the existence of the miniatures. Consequently, while supply is limited, so is the current demand. However, unless you can arrange for substantial periods of search time in Germany and are very lucky, my advice would be not to get caught up in the quest to collect all the Limität miniatures. To the best of my knowledge, there are currently only two or three complete sets in the world. As indicated proviously, with the demise of Gerz in 1999 the Limität series was necessarily terminated. However, it should be noted that two companies attempted short-lived efforts keep the series alive. The first of these, DOMEX Geschenk-Manufactur GmbH, which had purchased the rights to the Gerz name, produced “Limität” editions in 2000 and 2001, complete with a Gerz logos and hanging medallions. These two steins were supposedly based on designs already in the Gerz pipeline when the company went out of business but, for whatever reason, they were not well received by collectors and no further efforts were made by DOMEX to add to the series. Another company, Zöller & Born Feinsteinzeugfabrik, also took a shot a picking up where Gerz left off, with two “Limität” steins of their own. 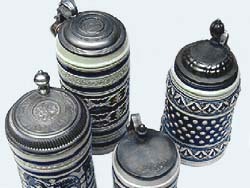 The Zöller & Born steins were produced with relatively low quality lids and, in general, were seen by collectors as even less desirable than those produced by DOMEX. That effort was also halted after the 2001 edition. To use this catalog, simply click on the Gerz Limität stein you would like to see. Should you wish to “browse” the catalog, you may do so by clicking on the “Previous” and “Next” buttons at the bottom of each catalog page. To return to the listing, click on the “Go to Listing” button, which can also be found at the bottom of each catalog page. © 2000-2019 Beer Stein Library — All rights reserved.